The study of the fundamental theory of strong interactions, Quantum Chromo Dynamics (QCD), under extreme conditions of temperature and density has been one of the most challenging problems in physics during the last 20 years, capturing increasing experimental and theoretical attention. There are several reasons underlying such a vivid interest. 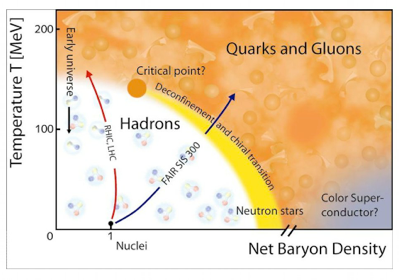 QCD is a quantum field theory with an extremely rich dynamical content; it is the only sector of the Standard Model whose collective behavior is accessible in the laboratory; moreover, the Early Universe was filled by a Quark-Gluon Plasma (QGP), the state of matter created in the present and future heavy-ion facilities. RHIC experiments, conducted at Brookhaven National Laboratory, have shown indications that such a state of matter behaves like a nearly "perfect fluid", i.e. with very small shear viscosity. At RHIC energies this quantity appears to be close to the lower bound predicted by supersymmetric gauge theories in the infinite coupling limit. Interestingly and surprisingly enough, also in the heavy quark sector there are hints that viscosity is similarly small. Furthermore, some evidence of a new phase of QCD, the color glass condensate (CGC), has been found, while its relevance is envisaged to increase at the upcoming LHC energies at CERN. 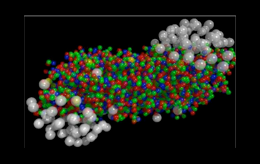 The main goal of our group is to achieve a microscopic understanding of Quark-Gluon Plasma (QGP) properties by calculating fundamental observables from first principles and systematically relating them, for the first time, to experimental measurements, thus building a necessary bridge between fundamental theory and relativistic heavy-ion experiments. Our approach will play a key role to reach conclusive scientific statements in the comprehension of the QGP properties at both RHIC and LHC facilities. The theoretical and phenomenological approaches to the physics of the QGP are usually treated separately, thus inevitably reducing their usefulness to understand the pertinent experiments. On the contrary, we will build an interplay from which both approaches will mutually benefit, by maximally exploiting the information and tools that each method can provide. In addition, a further outcome of our research program is to create a theoretical background for the upcoming physics at FAIR focused on the search for the QCD critical point. This, indeed, represents the major enterprise in Europe in the field of nuclear and hadron physics as stated in the approved HadronPhysics2 project at the FP7 European program.